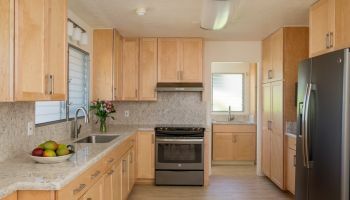 After hearing Homeowners Design Center expert Randall Omoto speak at a recent BIA Home Show, a local Oahu personality was impressed, and reached out to hire the remodeling and custom design company for a kitchen makeover. Before the wall was taken down. As with all kitchen remodel projects, Homeowners Design Center began with a home visit, where Omoto discovered a common conundrum. “Many of our projects have an over-utilized space and an under-utilized space, and what we’re trying to do is get more use out of that under-utilized space, and try to combine [them],” he explains. After the wall was taken down. The homeowner's major complaints were the size and layout of the kitchen. “The homeowner wanted to incorporate a little bit more of an open feel, and at the same time make the kitchen a little bit larger,” says Omoto. Homeowners Design Center knocked down the wall between the hallway and the kitchen, immediately growing the kitchen 3 feet in the process, as well as now making the space dual-purpose. 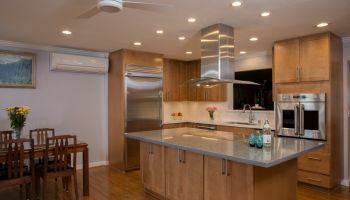 As with every project, this kitchen came with its own unique challenges—one being the homeowner’s desire for an island with a cooktop and hood to be incorporated to the existing layout. Homeowners Design Center had to figure out a creative way—adding posts (matching the already existing ohi'a ones), as well as a soffit on the ceiling—in order to allow this to be added both with style and structural soundness. Specifically, the utilization of the soffit allowed the designers to craftily conceal the duct work for the hood, as well as the transformer for the lighting. Soffit created to receive the hood and house the transformer and the pendant lights. Known for their durability and longevity, the homeowner chose Diamond brand cabinets in a Shaker design, which also allowed her to keep her existing cherry, red, wood flooring without clashing. The chosen countertops’ unique hue—shivaskashi yellow—also perfectly complements the flooring’s existing palette. Omoto advises to look for three things when choosing cabinets. Make sure that they are KCMA (Kitchen Cabinet Manufacturers Association) certified, which checks formaldehyde emission levels in cabinetry components, among other things. Are CARB (California Air Resources Board) compliant. Finally, that they have a lifetime warranty. To see more projects by Homeowners Design Center, or to find out how they can help you with your kitchen remodel, just click on the company name or on any of the photos (except the video image).